Final Stand? More like Final-ish Stand, am I right? Right? Guys? If you thought the Final Stand DLC was the end of the road for Battlefield 4 (like I did, given its, you know, final-ish name), EA and DICE have a surprise up their Levolutionary sleeves. According to a post on Battlefield 4's Battlelog service today, there is more DLC on the way for DICE's seminal shooter. "We will share details on exactly what this new content will be, and when it will arrive, in the near future," said the developer in the blog post. "We understand that this may lead to even more questions about our plans, but rest assured that we'll get back to you on the future of Battlefield 4 when the time is right." One hint given later in the blog post is that the next batch of DLC will likely include at least one additional "classic" Battlefield 4 map. The Second Assault DLC bundled four such maps, including Battlefield 3 maps Operation Metro, Operation Firestorm, and Caspian Border, and Battlefield 2 map Gulf of Oman. 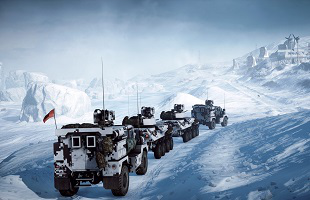 Thankfully, DICE has a survey up that lists every map from every Battlefield game ever made, where you can choose which favorites you would like to see get the Frostbite 3 makeover. You can seemingly choose as many maps as you want, so please go heavy on the Battlefield 1942, Battlefield 2, and Vietnam maps. Let's hope the next (and presumably last) round of DLC goes off without a hitch!